"A passionate, liberal environmental activist and a straight-arrow conservative lawyer looking to the senate set the sparks flying in this nonstop, beautifully crafted adventure that skillfully unwraps a multilayered plot, adds an abundance of colorful characters and a familiar setting, and proves in no uncertain terms that opposites do attract." "IT HAPPENED AT CHRISTMAS is the perfect story to begin the holiday season and would make the perfect gift for anyone - including treating yourself! 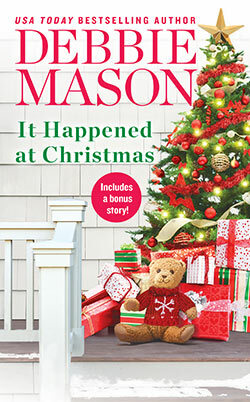 I adored IT HAPPENED AT CHRISTMAS and eagerly await the next novel by the wonderfully talented and always delightful Debbie Mason! Debbie Mason gives the best gift of all in this funny, heartwarming novel that touches the very core of Christmas. If you love Christmas themed books, you will really enjoy this book. I know it has become part of my permanent Christmas book collection." "This was a fascinating story to read. I found that these characters seemed to come alive on each page as you read through the story. There were several areas in this read that caused me to laugh out loud. The situations were so funny. I don't want to give any of it away other than to say you must pick up "It Happened at Christmas". See for yourself how well this author gives us such a wonderful love story." "Very sweet story. Loved every chapter and I did not roll my eyes, huff or feel annoyed toward any characters in the book. I laughed, I cringed. I sighed. And I got teary eyed, then sighed again. This story is fantastic and filled with so much emotion." "Take another trip to Christmas, Colorado, and you'll be guaranteed a wonderful time. This is the third entry in this lovely romance series. Fans of stories about small towns charming the big city slicker, and of lots of snappy dialogue and a little bit of drama will be well pleased."